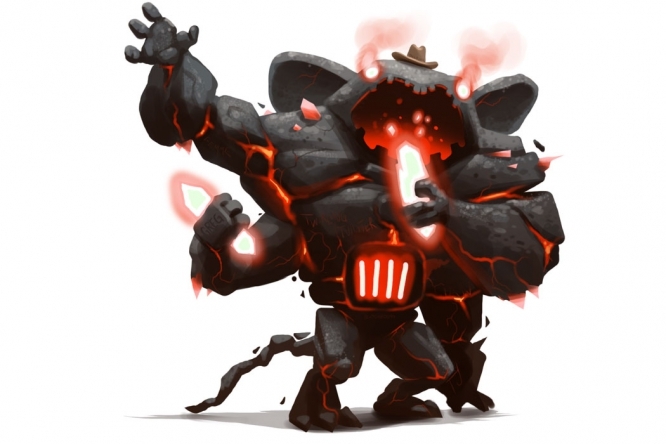 The Magmatic Golem Mouse is a breed of mouse found in the Gnawnian Express Station. It can only be attracted and caught during the Daredevil Canyon phase and only with Magmatic Crystal Charms armed. They are known to drop Fuel Nuggets and Tin Scraps as loot. Deep within the bowels of the dark and unexplored caves near Claw Shot City lives the Magmatic Golem Mouse. Accidentally stumbled upon by the pyrite miners during a deep excursion, this mighty mouse feeds on the magmatic crystals found within the bedrock below the mines. Naturally quite a gentle creature, they have been captured and controlled by the raider mice who starve them of their crystals until they grow into a rage and then release them into the fray! The raiders use magmatic crystals as a form of control to keep these mice in check, and hunters with the right equipment can do the same. They are dangerous mice, but they carry plenty of Fuel Nuggets with them, so it's worth the risk. Use Magmatic Crystal Charms to attract this mouse. Magmatic Golem mice have no specific preference for any kind of cheese, but can only be attracted when a hunter has a Magmatic Crystal Charm armed. Law type traps such as S.L.A.C. are very effective against the Magmatic Golem Mouse. The Magmatic Golem Mouse drops the Gnawnian Express Egg and the Magmatic Golem Egg during the annual Spring Egg Hunt. This page was last edited on 22 May 2017, at 17:24.